Begin by making your life a work of art. You don’t have to be a super-achiever. You don’t have to be unusually creative. You don’t have to endure great obstacles. 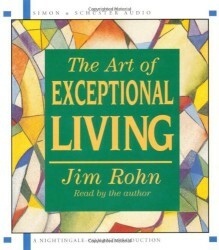 According to success expert, Jim Rohn, you don’t have to do exceptional things at all. Just do ordinary things exceptionally well. That’s The Art of Exceptional Living.